should have done M.Ch/ D.M/ M.D.S. Interested and eligible candidates can apply for these posts through online mode only. The official website of OPSC for applying Assistant Professor Posts is www.opsconline.gov.in or www.opsc.gov.in. The online application forms will be available from 12-10-2018 onwards. The last date to submit the application form through online is 12-11-2018. 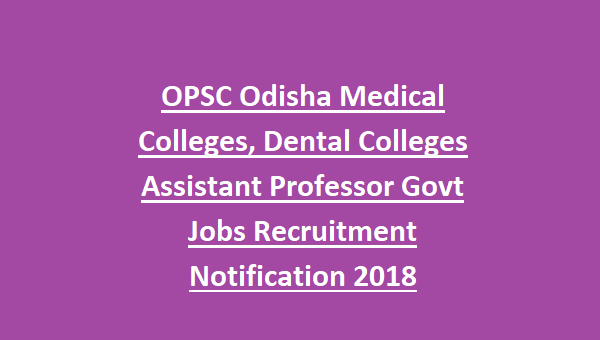 For more details of age limit, selection process, salary, application fee, exam pattern and syllabus and how to apply are given below for Recruitment of Assistant Professor Posts in OPSC 2018. 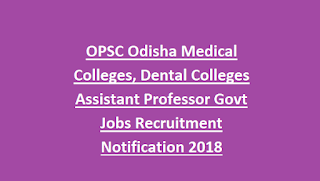 As on 1-1-2018 the age limit for the candidates apply for Assistant Professor Posts in OPSC is in between 21 – 45 years. The educational qualification for the Assistant Professor posts is candidates should have done M.Ch / D.M / M.D.S. for more information candidates can refer in the official notification of OPSC Recruitment 2018 given below. The salary offered for the shortlisted candidates for Assistant Professor Jobs is RS.15600 – 39100/- + AGP Rs.8000/-. The application fee for the candidates belongs to Gen/OBC category is Rs.300/-. There is no application fee for SC/ST/Ex-s/PWD category candidates. The last date for payment of application fee at any branch of SBI is 15-11-2018. The candidates will be selected based on the Written examination, Career marking and Document verification. For Career Marking will be given 30% and for written Test 70% will be given. The written test will be comprising of Multiple Choice Questions (MCQ) pattern total 200 questions with duration of 3 hours. Qualifying marks for UR/SEBC candidates is 50 %, for PWD is 45% and for SC/ST is 40% in both career and written test. MCI approved DM or M.Ch. syllabus for Super Speciality Discipline. MDS syllabus of DCI for different Dental Discipline. Interested and eligible candidates can apply for these posts through online mode only no other mode will be acceptable. The official website of OPSC for applying Assistant Professor Posts is www.opsconline.gov.in or www.opsc.gov.in. The online application forms will be available from 12-10-2018 onwards. The last date to submit the application form through online is 12-11-2018 along with the necessary documents, full signature & L.T.I must be identifiable/visible. For more details candidates can check in the official notification given below.